In 1960, Gerard P. Kuiper founded the Lunar and Planetary Laboratory (LPL) in a tiny corner of the top floor of the University of Arizona’s Atmospheric Sciences Building, staffing the new laboratory with young scientists, many of whom became prominent in the field in the coming decades. Fifty years later, many of LPL’s original founders are still active in the field of planetary science, and LPL has remained at the forefront of planetary studies, conducting research through astronomical observations, theoretical studies, spacecraft, and the studies of samples from space. 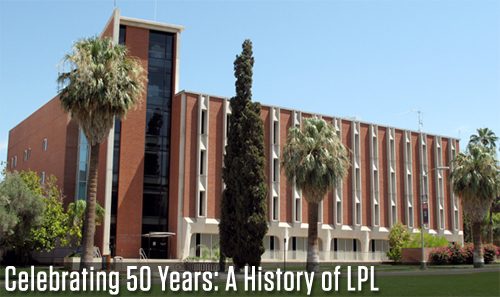 During this 50th anniversary year, we plan to hold a series of events, including special public events, lectures by some of the alumni, and an anniversary weekend for those who have passed through LPL. Information on these special events will be posted here. This site already features interviews with many people who were a part of LPL’s first 50 years. We encourage you to join us in the celebration by contributing your own memories of LPL using the submission form on this Web site.